Nasir Jamshed may not have done much as batsman besides scoring three ODI centuries against India, but he has definitely started a trend in Pakistan. He is the showstopper of Pakistan Cricket Parody accounts on Twitter. There are so many parody accounts on Twitter now that it has become hard to keep a track of all of them. I don't know which one of them came first but they are all doing a fine job. None better than BIG NAS however. Overview: The account has been around for over a year but it truly gained popularity during the World Cup and with close to 60,000 followers is easily the most popular parody account in Pakistan. He is absolutely hilarious and borderline racist (ask the Bangladeshis). Every single tweet from that account leaves you in splits. Pet Tweets: about his buffalo, his love of food, the love affair brewing between Shahid Afridi and Ahmed Shehzad, and a take on everything related to Pakistan cricket. Overview: The account has been around for a while and is an extremely funny take on the great batsman's accent. Ith all aboul la way he thpeaks. Almost as funny as BIG NAS. Pet Tweets: about everything from cricket to football, bollywood, and politics. He doesn't hide his love for the fairer skin either. Overview: This one is not as funny as the above two but he surely packs a punch like the batsman. This is a brilliant take on the bitter man that MoYo is and leaves no stone unturned in criticizing Afridi, Misbah, and the entire PCB establishment. Much like MoYo the cricketer. Pet Tweets: about Pakistan cricket news and his take on it, bashes the entire Pakistan cricket establishment, and he also gets involved in educated discussions on the game. This is one of the few parody accounts that you can have an actual discussion with. Expect a lot of sarcasm. Overview: Even though this one does not claim to be a parody account, it is. For a long period many people actually followed it thinking it was Misbah Ul Haq. The account has been around for quite some time and is very popular. Pet Tweets: mostly about Misbah's grievances with his critics as well as his own team. Bashes Sikandar Bakht, MoYo, Shoaib Akhtar, and his team members. Funny at most times, but not always. Overview: This one seems to be a fairly new one. Going by the name it probably came into being once Azhar Ali was announced as ODI captain. The account hasn't yet gained as much popularity as the other ones but has the potential to be quite popular. Pet Tweets: about his kaala til (black mole), calls his team the spirited leopards, and keeps no secret about his love for Sarfraz, Asad, and selfies. Overview: This one is not really a parody account per se, but it is a sneakily smart take on Shahid Afridi's official twitter handle. He is not funny but he tweets acting as if he is actually Shahid Afridi. There are plenty of people out there who have fallen for him thinking that its actually Afridi tweeting. Pet Tweets: about Afridi, his lover Shehzad, and all other activities related to them. Speaks to other cricketers as if he's Afridi. 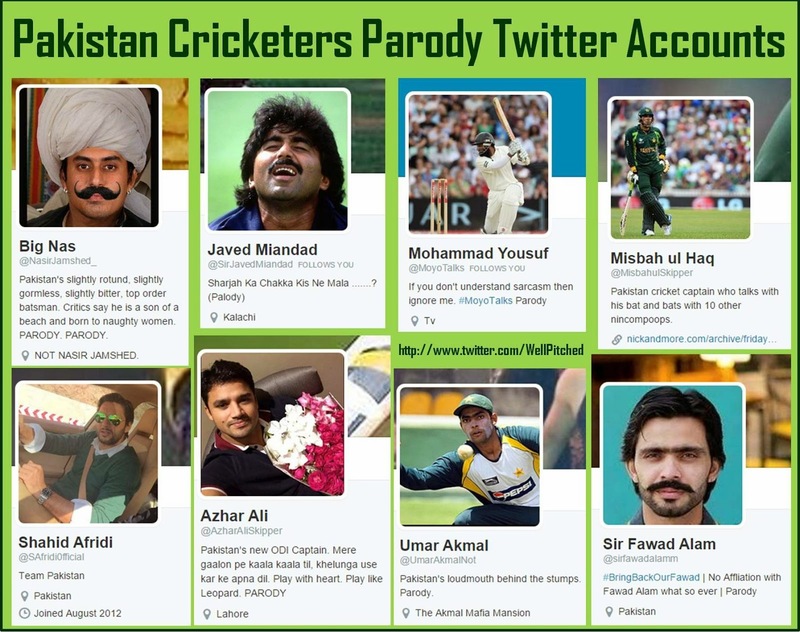 Overview: Another account that claims to be a parody account and has no affiliation to the real Fawad Alam. Came into being during the time Fawad was dropped from the team. Funny at times only. Pet Tweets: about bringing Fawad Alam back, support for his Pakistan team mates, and digging at the Indians. Overview: Like the cricketer, this account has been inactive for quite some time, but when it was around it had people in fits in short bursts, like his innings. Pet Tweets: about his talent, potential, Misbah's tuk tuk, and hafeez' sideburns. There might be more of these parody accounts out there. There are several under the name of Shoaib Akhtar and Inzamam Ul Haq, which don't have the Twitter verified tick nor do they claim to be a parody account. They aren't funny however. If you know any others from Pakistan, please do share with us!